The new 2013 Dodge Dart has been receiving a lot of well-deserved attention from the auto industry and critics worldwide for its sophisticated technology and luxurious available features. The 2013 Dodge Dart offers everything you are looking for in a new car and much more. In the 2013 Dodge Dart you can expect to find incredible features and amazing style at an affordable price. 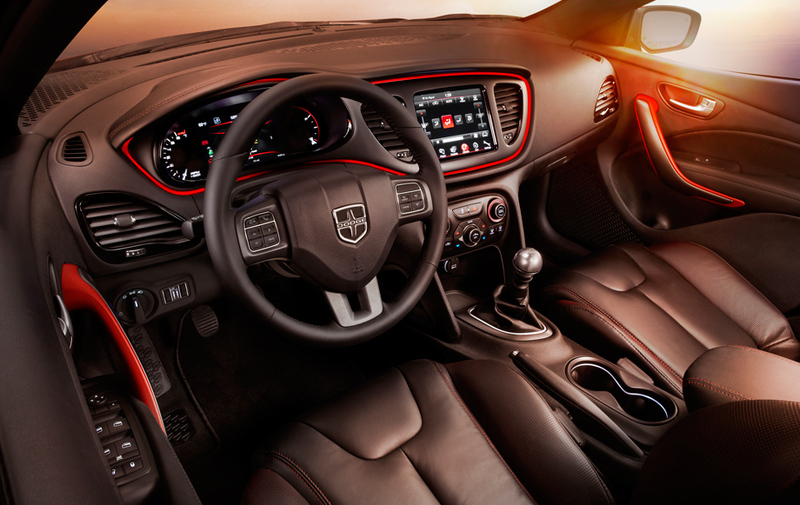 The new 2013 Dodge Dart features the best-looking interior in its class. A beautiful mix of design and technology makes you feel like you are driving the future of Dodge. As the most technologically advanced car in its class, the Dodge Dart includes a number of class-exclusive features, including a premium 7-inch Thin Film Transistor re-configurable cluster display. Not only does the display deliver real-time information on performance, navigation and vehicle status, it truly comes alive with countless ways to reconfigure in full color and incredibly rich graphics never before seen on a compact car. A warm, ambient glow washes over you as you start the car; pair with the available signature red floating-island bezel, with a Uconnect® 8.4-inch touchscreen, you’ll feel like you’re driving into the future. The Dart’s available leather trim tops off its Best-in-Class interior by offering several color choices, coupled with refined animal grain surfaces and premium leather trim to make each trip even more comfortable. The new 2013 Dodge Dart gives you the choice of three different engines that all give you incredible performance and fuel economy. The three available engines are paired with your choice of two suspensions that help blend together the perfect mix of relaxation and driving excitement. Choose from a 2.0L 16-valve Tigershark four-cylinder engine, a 1.4L 16-valve intercooled Turbo with MultiAir, or a 16-valve 2.4L Tigershark MultiAir II four-cylinder engine. Dodge engines are known for their smooth, lively rides, and all the Dodge Dart powertrains provide excellent fuel economy. The Dart’s six-speed close-ratio manual transmission gives its driver a real feel for what it can do. Of course, if you like the easy shifting that comes with an automatic transmission, then choose the six-speed PowerTech automatic transmission or the available Dual Dry Clutch Transmission with AutoStick (depending on your choice of engine and models). The Dodge Dart is the first Dodge vehicle to use an active grille shutter system that reduces drag by redirecting airflow around the front and down the sides, rather than through the vehicle, enhancing aerodynamic performance. Furthermore, the Dart features MultiAir technology to help increase low engine torque, improve efficiency, and reduce emissions. The result is significant: optimal combustion at any speed under any driving condition. Dodge Dart’s MultiAir is one of the many features that allow impressive fuel economy without compromise. When it comes to safety, the 2013 Dodge Dart leads its class with 60 standard and available safety features that include 10 airbags and reactive front head restraints. 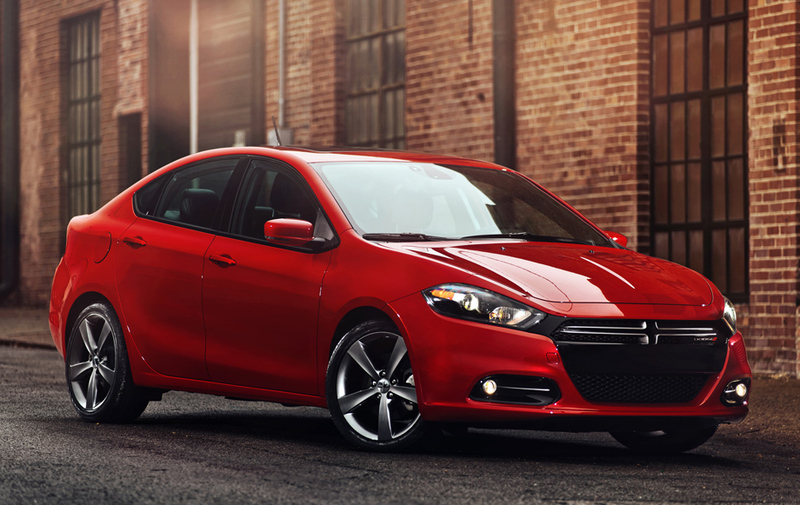 With the Dodge Dart, you monitor the road and leave the monitoring of other things up to it. The Dart features a system that displays the amount of each tire’s pressure in the Electronic Vehicle Information Center, alerting you if one tire (or more) falls below the recommended pressure. Several security features have been added to help make the Dodge Dart as safe and secure in the parking lot as it is on the highway. Chief among these are the keyless entry system and a security alarm, which keeps would-be thieves at a safe distance. As a feature on the Dodge Dart Limited, Keyless Enter ‘n Go™ lets you to unlock the doors by touching the front door handles as long as you have the key fob on you. Once inside, you can start the engine by pressing the Engine Start/Stop button and stepping on the brake or clutch pedal. Rain-sensing wipers detect moisture on the windshield and activate automatically. The system is especially useful for sudden road splash from other vehicles. You don’t have to take your hands off the wheel to adjust the wiper controls as the rain level changes. Accident avoidance is a top concern of drivers on the road today, and Dodge has taken that concern into consideration with the 2013 Dart. Say you’re on a wet or icy road. If the Dodge Dart starts heading in a different direction than where you’re steering, standard Electronic Stability Control helps maintain directional control by applying selective braking and reducing engine throttle during extreme steering maneuvers. Parkview® Rear Back Up Camera and ParkSense® Rear Park Assist System give you hindsight that’s better than 20/20 in the Dodge Dart. These two technologies come together to make one of the most stressful parts of driving easier. When you’re moving in reverse, the available ParkView® Rear Back Up Camera displays a rearview image on the Uconnect® touchscreen, but the Dodge Dart doesn’t stop there. The available ParkSense® Rear Park Assist System uses ultrasonic sensors to help you spot objects in your intended path. There are certain things that a driver who’s backing out of a parking space just can’t see, like a car coming from either side. Available on the Dodge Dart Limited and GT, Rear Cross Path Detection helps solve that problem by using radar in the rear fascia to detect lateral movement on both sides of your car, and warn you when something’s crossing your intended path. The 2013 Dodge Dart offers performance and a driving experience that spells future, yet the comforts of a luxurious sedan. All Star Automotive is excited to be the number dealer of the all-new Dodge Dart for residents of Baton Rouge, Alexandria and surrounding areas. Visit http://www.allstarautomotive.com/ or call (225) 490-6409 to schedule a test-drive today! This entry was posted in Uncategorized and tagged 2013, alexandria dodge, all star auto, all star automotive, all star dodge, baton rouge dodge, dart, Dodge, dodge dart, louisiana dodge by All Star. Bookmark the permalink.